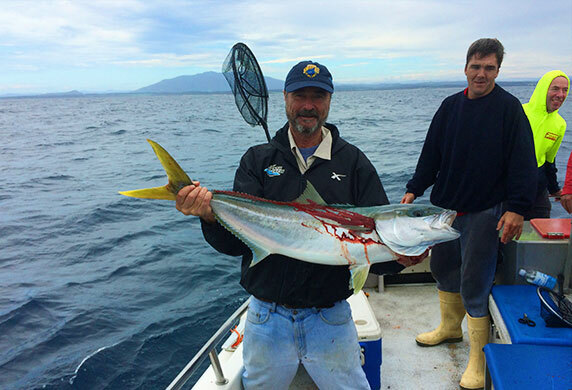 Enjoy a fishing trip with one of the most reliable Narooma fishing charters and tour operators. With specialist fishing boats, the latest equipment, and (most importantly) the best local knowledge our 12.5 metre boats are the two largest charter vessels in the area. Keep the fish you catch and have a blast! We’re committed to giving you a fishing experience that will bring you back for more! Our vessels Dreamtime & Sea Eagle are fully surveyed and your fishing licence is taken care of while onboard. 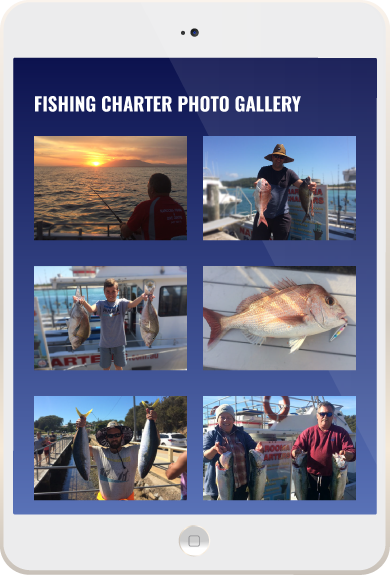 The skippers and crew have more than 25 years each experience fishing the waters around in the region – including Narooma, the Continental Shelf and Montague Island. Narooma Charters are berthed at Narooma town wharf which is the closest port to the island – it’s waters famous for fishing. Our powerful vessels will get you there quickly so you spend more time fishing and less time travelling to find fish. Supporting large groups, fishing licences are covered, all tackle is included (on a ‘replace if lost’ basis) and you get to keep all the fish you catch. Successful offshore fishing is not confined to the experts. Our novice anglers have recorded incredible captures and our skippers make sure that it’s always fun. Our vessels have the very latest in marine electronics & state of the art fishing tackle. We offer charters on an individual basis, or get a group of up to 12 people together and have the whole boat to yourself. Challenge yourself with some game fishing, or relax and reel in some of the South Coast’s most desirable table fish. We will even accommodate special tackle requirements if you’re chasing a particular type of fish. So book a tour today for an awesome experience with your friends & family – see you down at the wharf! *Please note you will need to bring your own food and drink, unless of course you enjoy eating raw fish straight from the ocean! Board the boat at lunchtime at the Town Wharf. 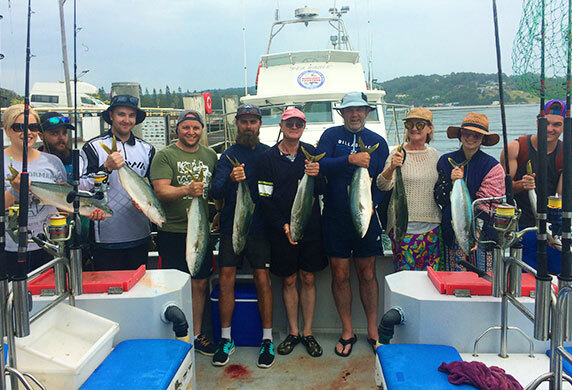 If you’ve never had a Narooma fishing charter experience before, you’re in for a treat! 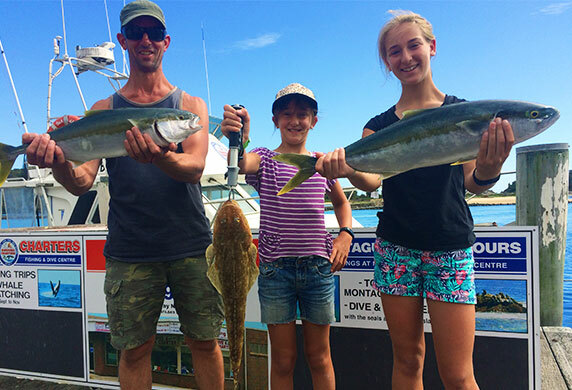 Enjoy an afternoon of fishing for flathead and catch heaps for dinner! Call 0407 909 111 to book! Start in the early morning and fish until lunchtime on our large, comfortable charter fish vessels! 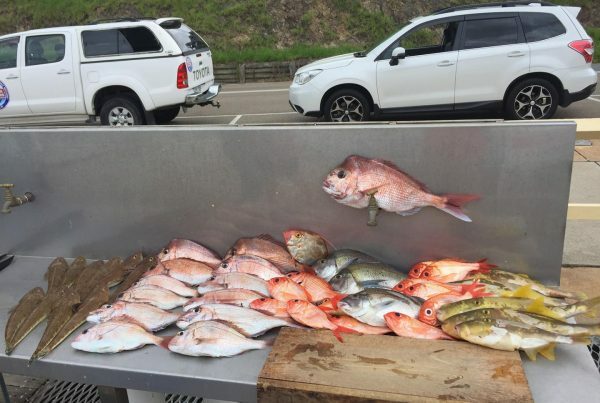 Board the boat at 12pm lunchtime and enjoy an afternoon of fishing with Narooma Charters – all in comfort on our large boats with experienced skippers. For serious fishers. We set out at daybreak and fish through the entire day. Bring food to last the trip! Sea Eagle is a 12.5 metre Stebercraft, custom built for Narooma Charters. Her twin 300hp Caterpillar motors give a smooth and comfortable ride for all passengers and crew. Absolutely awesome for large fishing groups – book your charter today! Book our boat Sea Eagle for your fishing group. Afternoon or morning (5 hours) of fishing. Maximum 12 people. Book our boat Sea Eagle for your fishing group. Half day (6 hours) of fishing. Maximum 12 people. Book our boat Sea Eagle for your fishing group. Full day (9 hours) of fishing. Maximum 12 people. Dreamtime is our 12.5 metre Nustar Catamaran, customised for superb ride, plenty of power and speed, Narooma Charters provides everything you need to be comfortable on board on your next fishing charter tour. Book our boat Dreamtime for your fishing group. Afternoon or morning (5 hours) of fishing. Maximum 12 people. Book our boat Dreamtime for your fishing group. Half day (6 hours) of fishing. Maximum 12 people. Book our boat Dreamtime for your fishing group. Full day (9 hours) of fishing. Maximum 12 people.